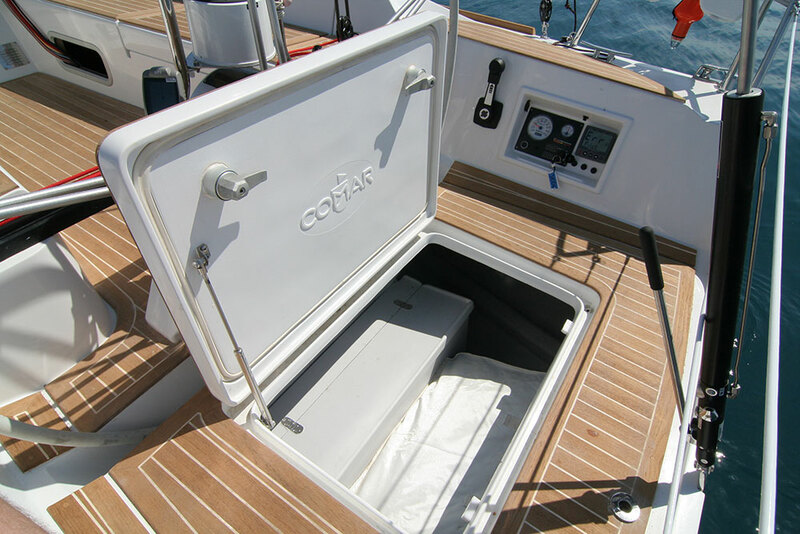 Founded in 1961, Comar was one of the first yards to use fibreglass for production craft. 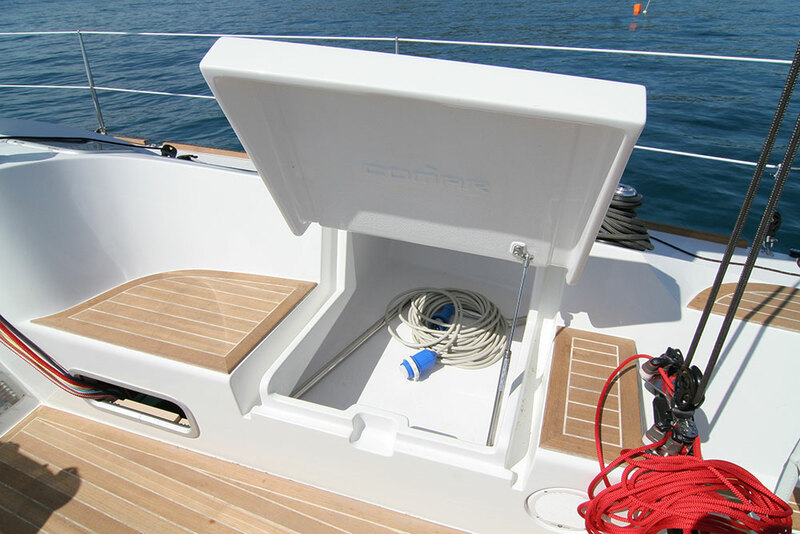 Today the Comet construction is a clever marriage of cutting-edge technologies and skilled artisan workmanship. 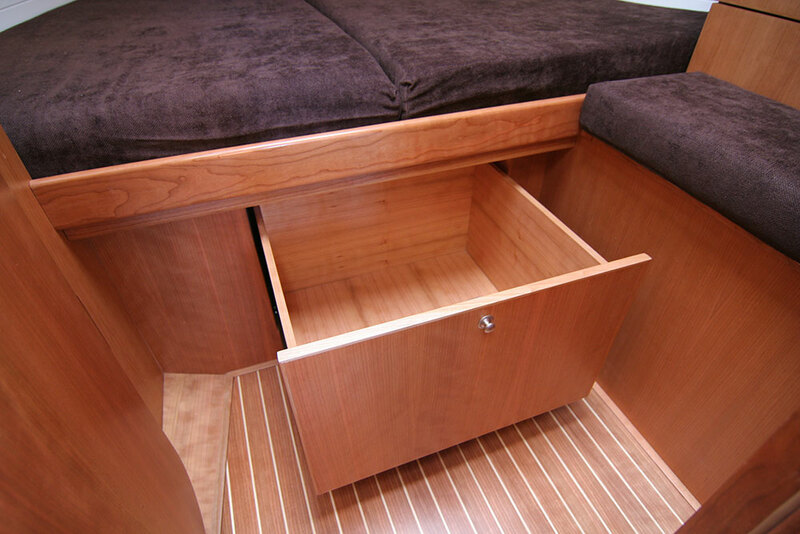 Most of the components you’ll find aboard your Comet – from hull to joinery, from opening hatches to steelworks – are all in-house custom made. 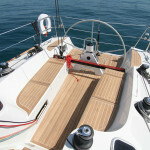 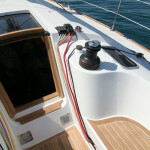 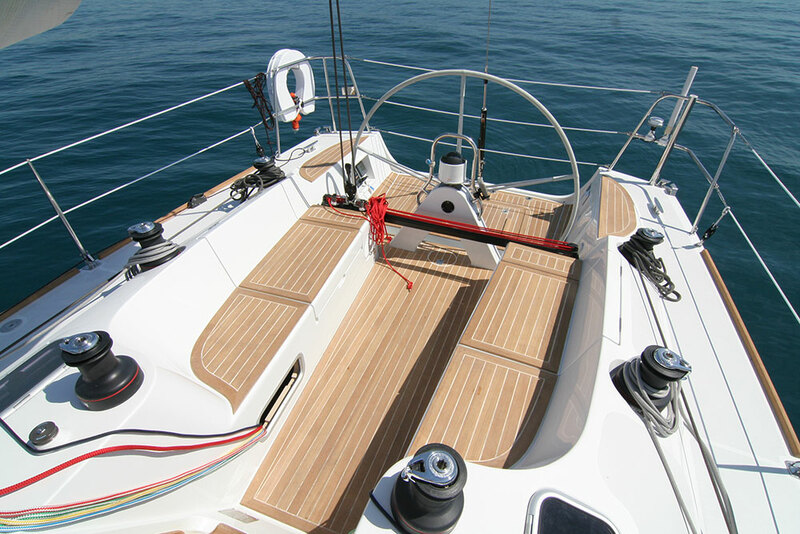 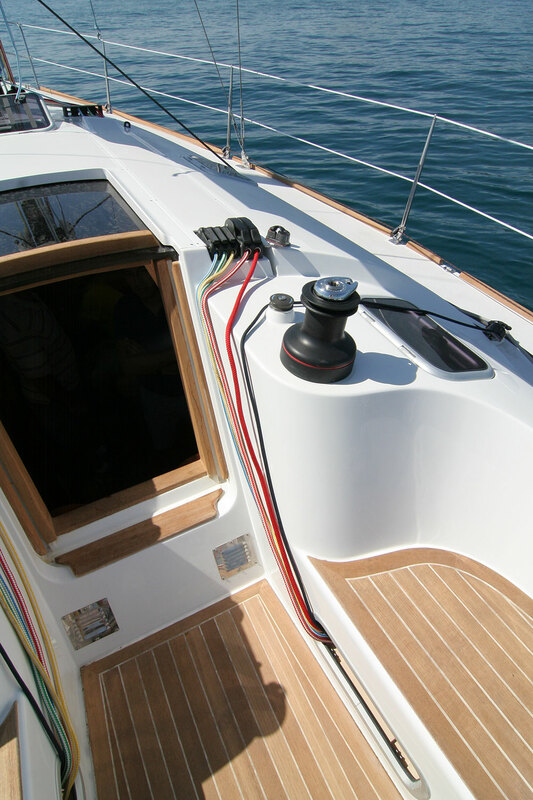 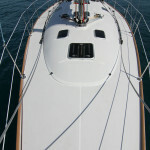 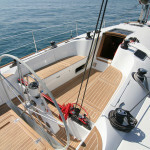 The hulls and decks are made from Airex sandwich, combining unidirectional and biaxial fibres and epoxy-vinylester resin. 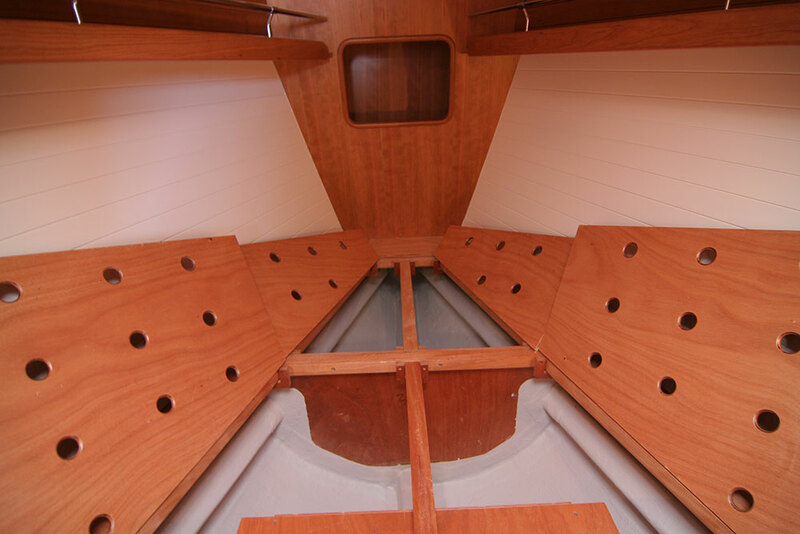 The Airex is glued to the skins using vacuum bagging and the reinforcements are layered directly on to the hull, something which avoids the use of inner moulds and delivers maximum structural rigidity. 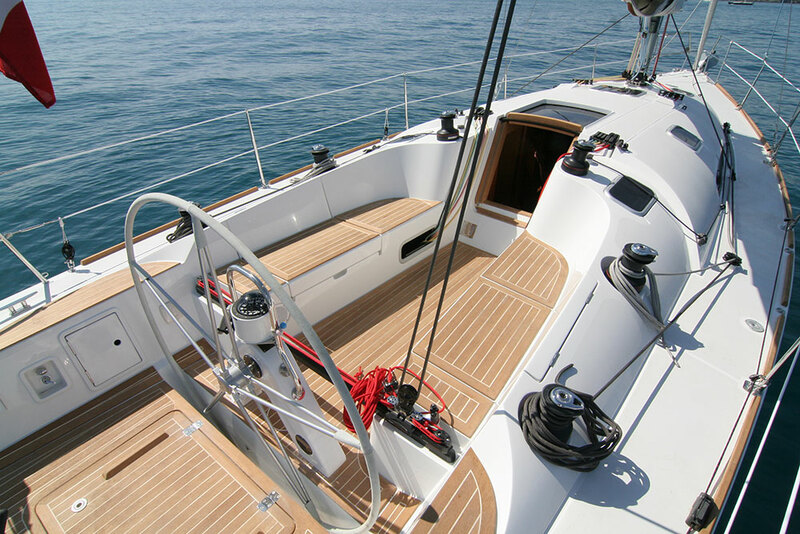 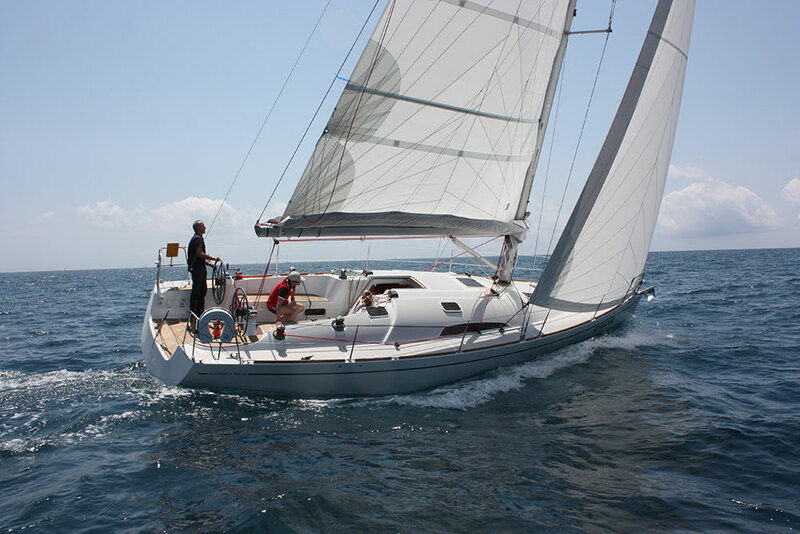 The deck of the Comet 38s boasts many functional and stylistic solutions which are usually reserved to larger sailing vessels thanks to the in-depth study during the design phase. 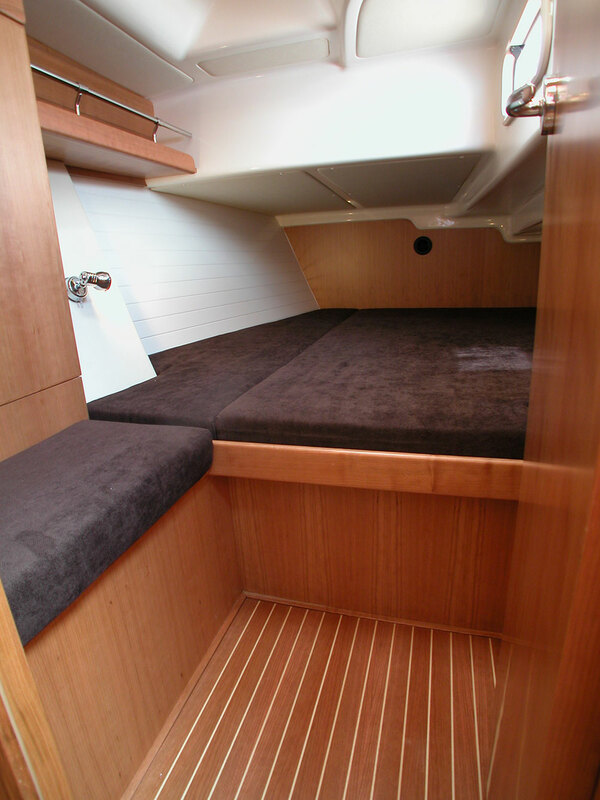 The open transom, one of the roomiest in her category, enhances the yacht’s soaring lines, while also offering a spacious sunbathing platform right on the water. 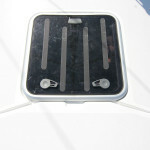 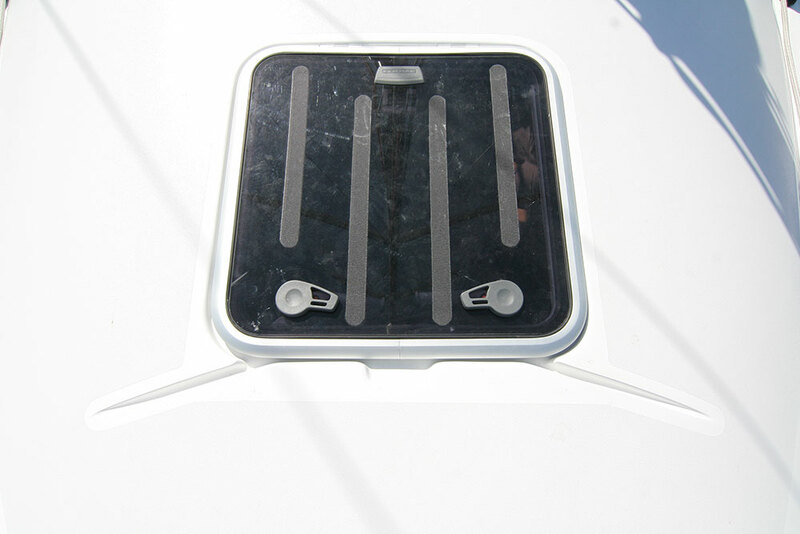 Seven flush skylights line the deckhouse, a signature trademark of Comar’s Sport line. 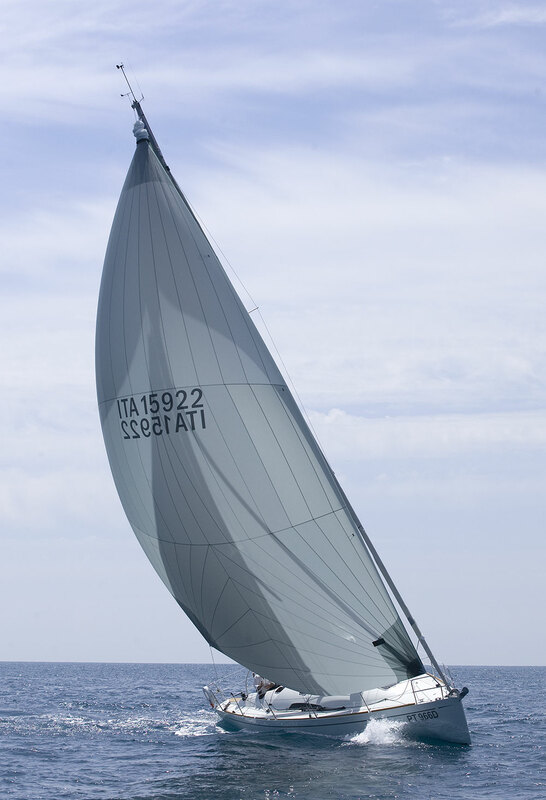 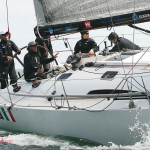 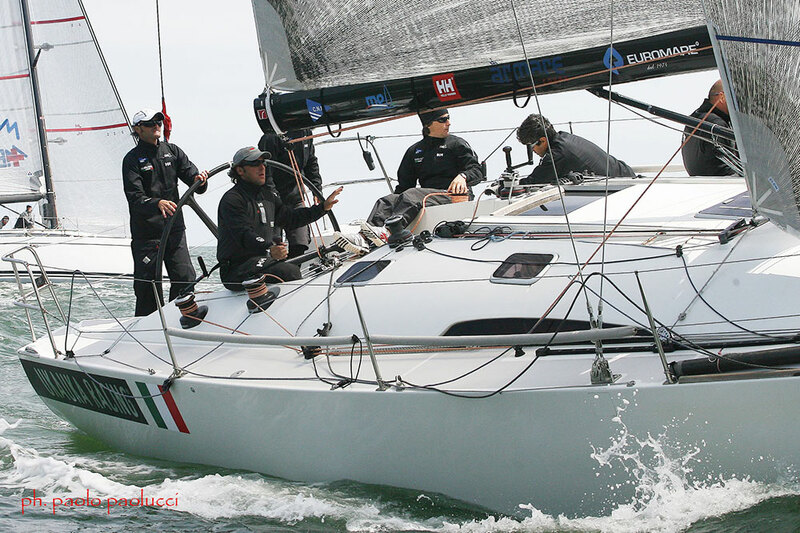 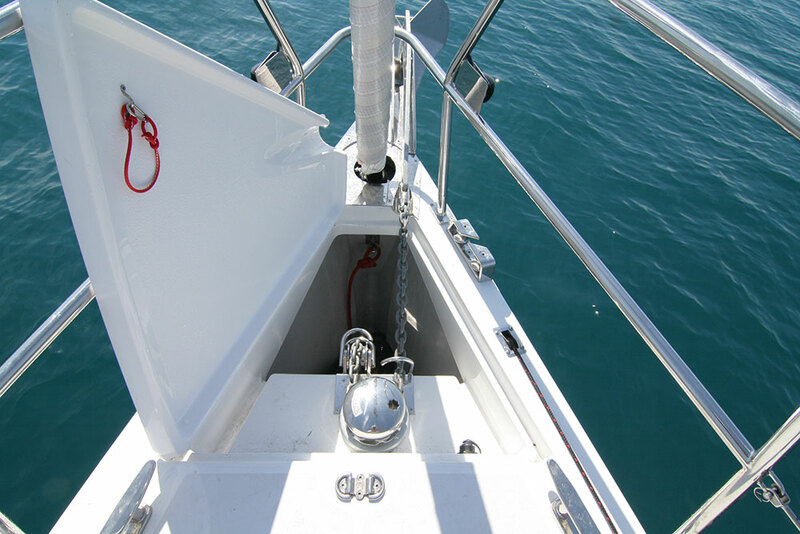 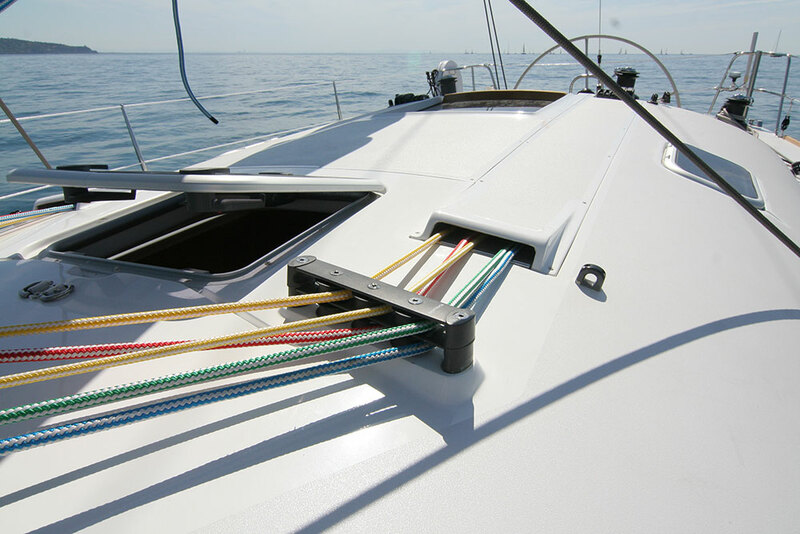 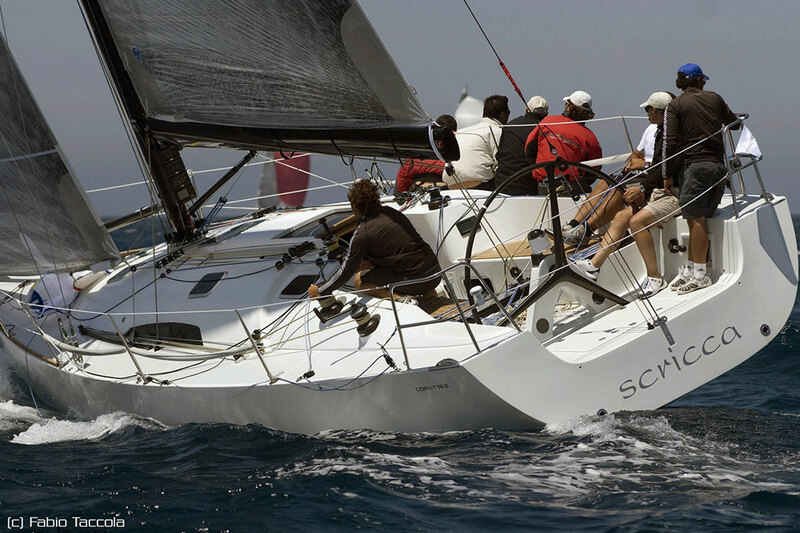 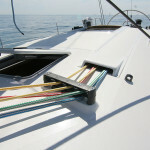 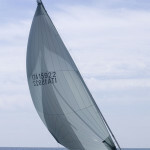 The running rigging’s layout makes maneuvering short handed easy and, when racing with a full crew, efficient. 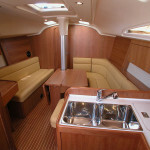 We offer two different versions of the interior layout, with one or two cabins in the stern. 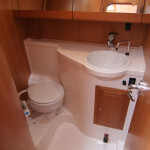 The head area remains the same, but instead of the second cabin it is possible to have a separate shower with its own door. 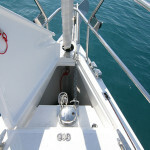 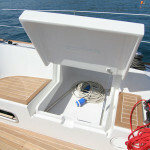 This can be useful for storing wet gear without cluttering the head. 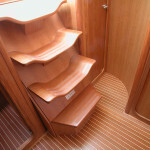 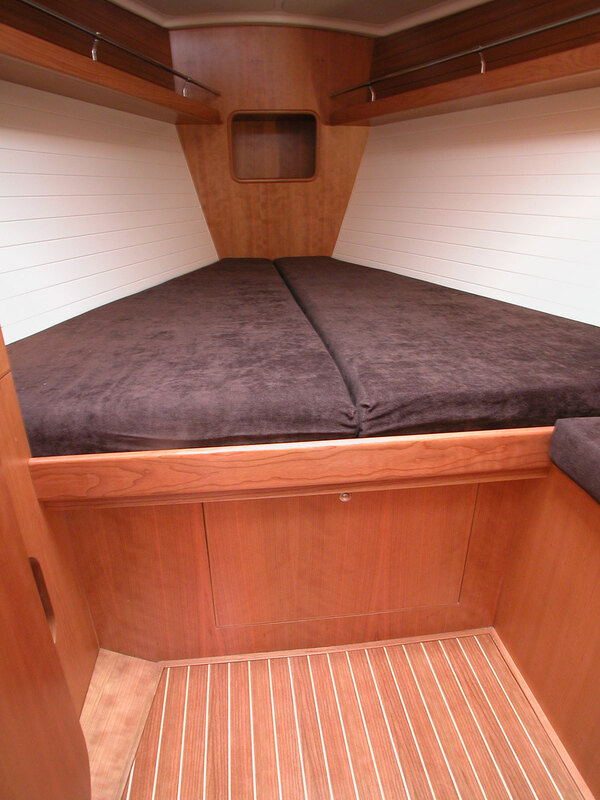 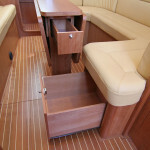 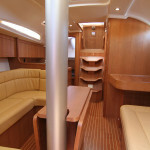 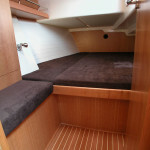 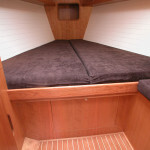 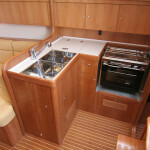 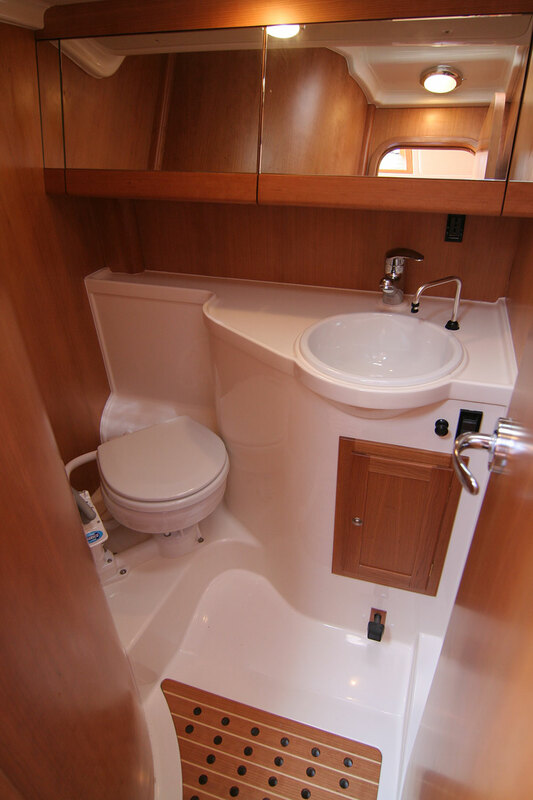 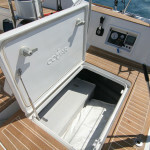 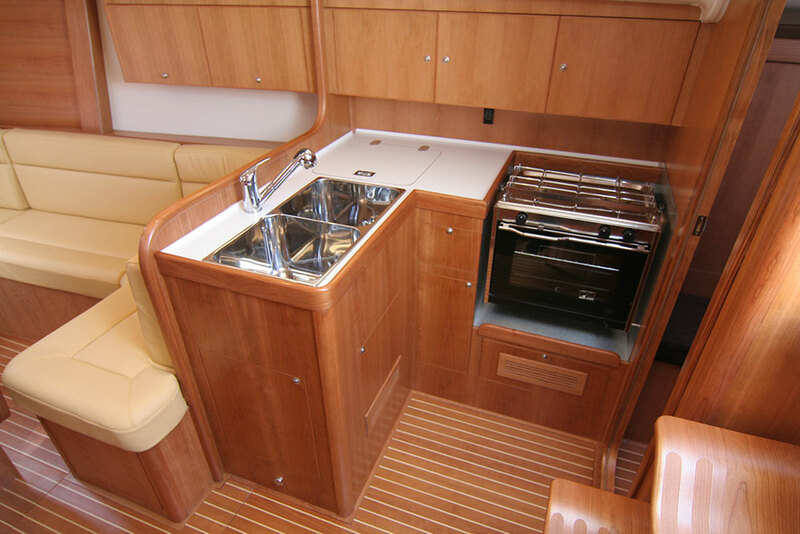 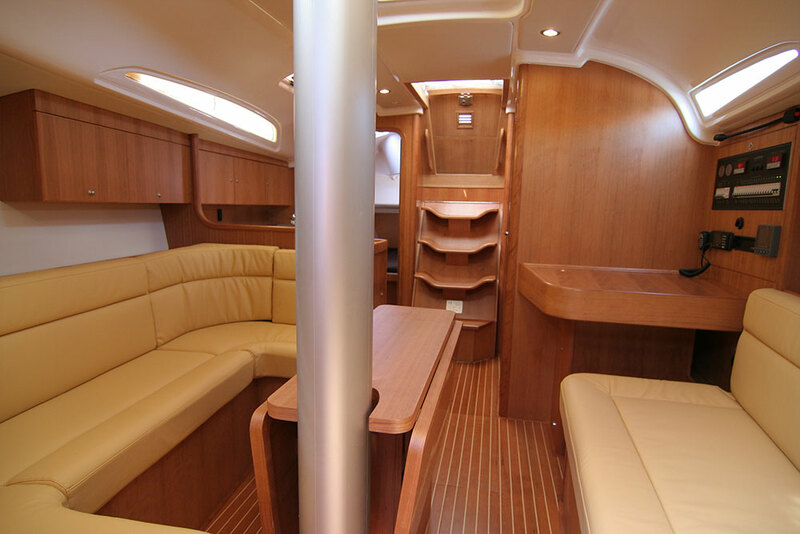 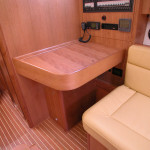 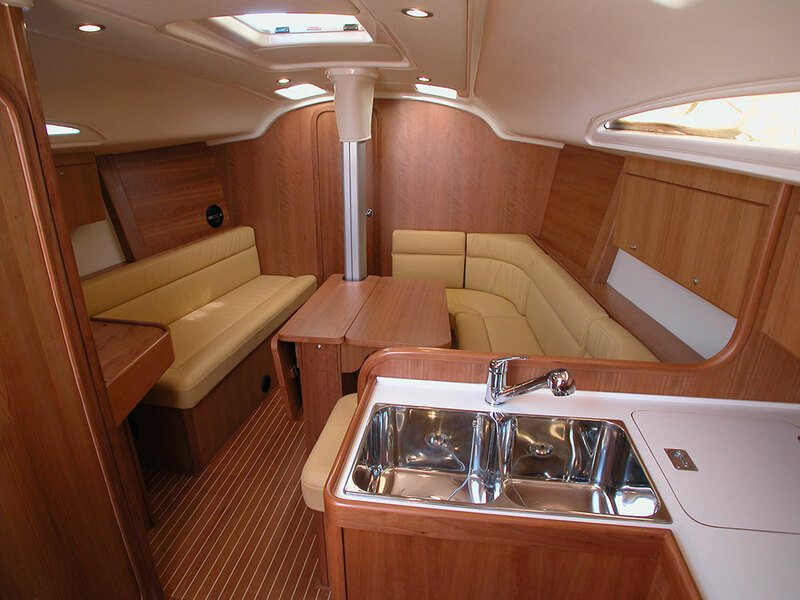 The saloon benefits from many light sources and the cabins offer generous size bunks. 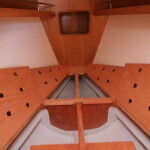 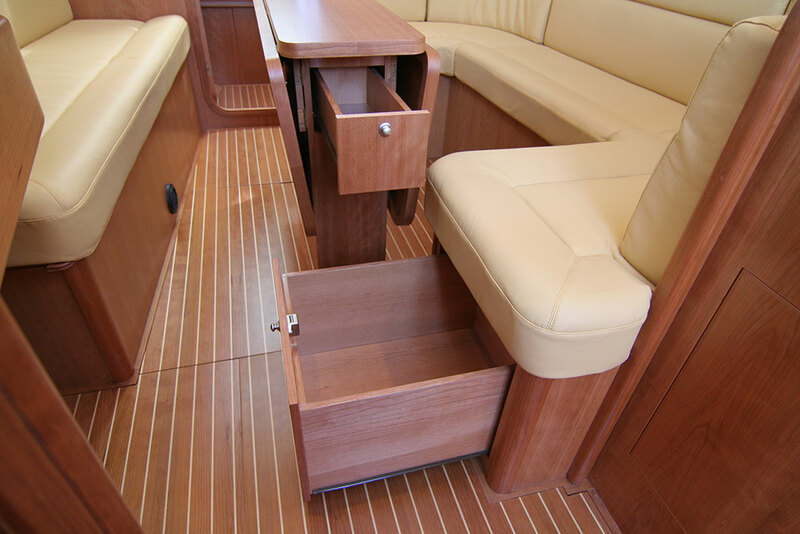 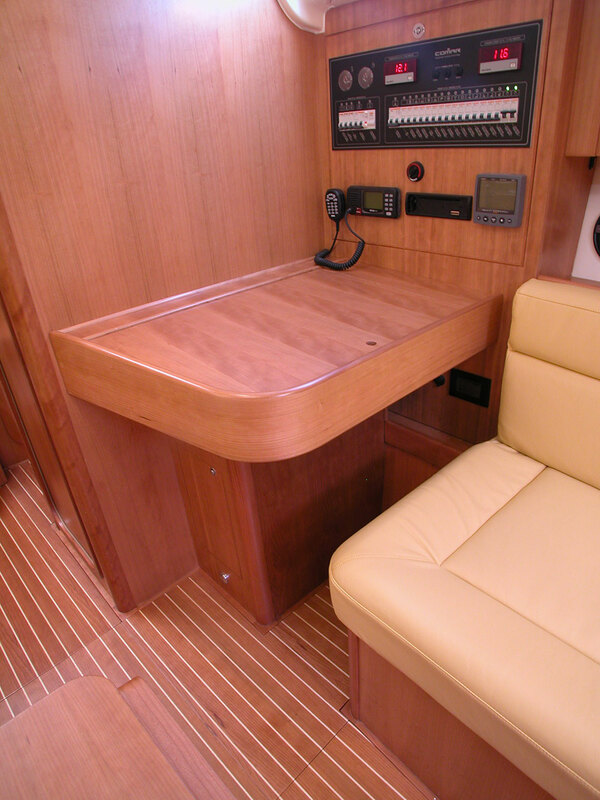 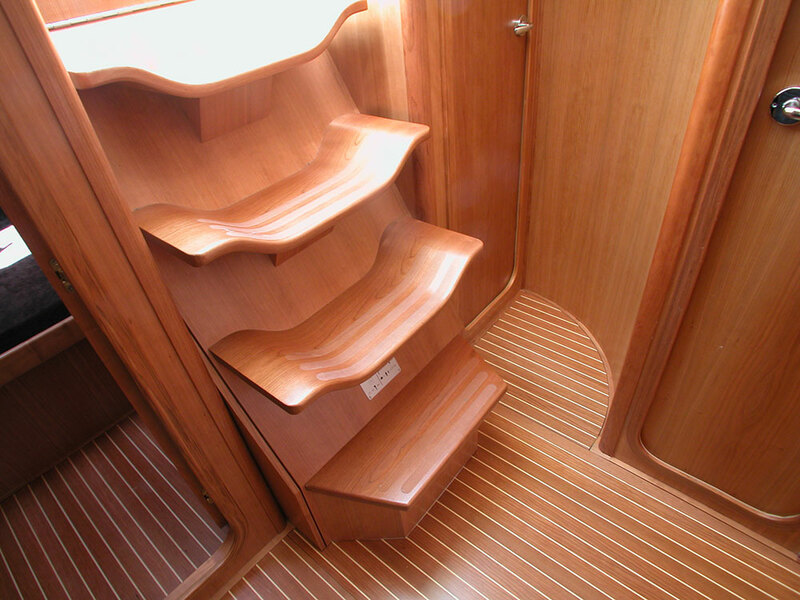 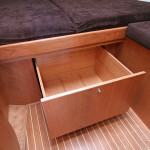 As usual at Comar Yachts, all interiors are built in cherry wood, but there are countless customization opportunities, from the use of oak or teak to lacquered bulkheads which can be built in composite as well. 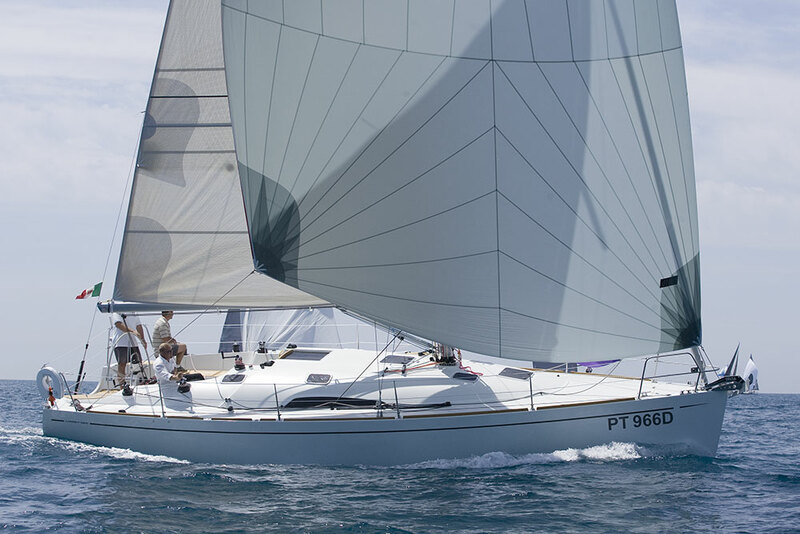 The great success we obtained internationally thanks to the previous Sport Yacht series, 41, 45 and 51, prompted us in developing a valid alternative to the popular 670 class honoring the same principles: top performance racing and ensuring at the same time great cruising livability. 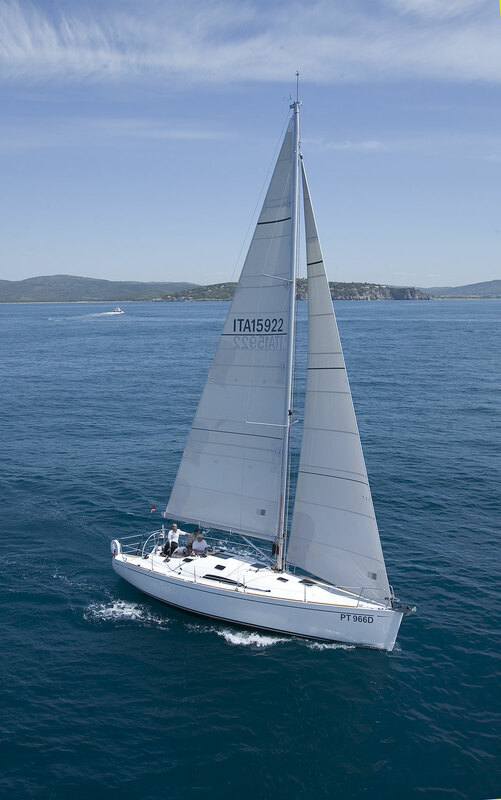 The streamlined hull reflects Vallicelli’s trademark signature, designed to guarantee an excellent performance with light winds while at the same time providing good sailing comfort in extreme conditions. 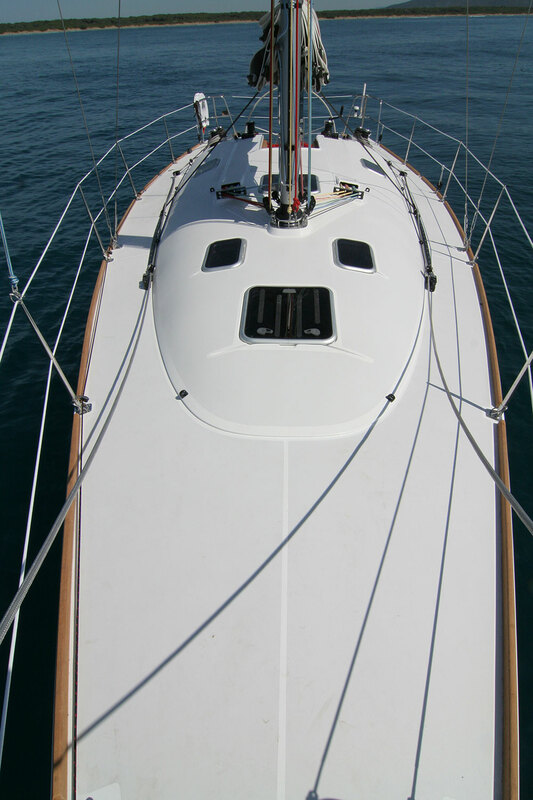 The Comet 38s has a modern and graceful water line, characterized by a minimal rake and by the typical rounded deckhouse with flush skylights. 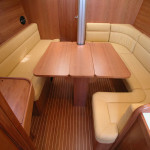 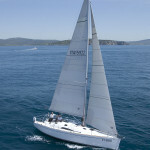 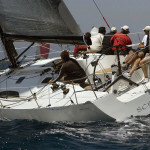 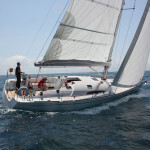 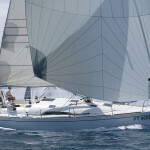 The result is a fast and sensitive yacht, always balanced but never over-responsive. 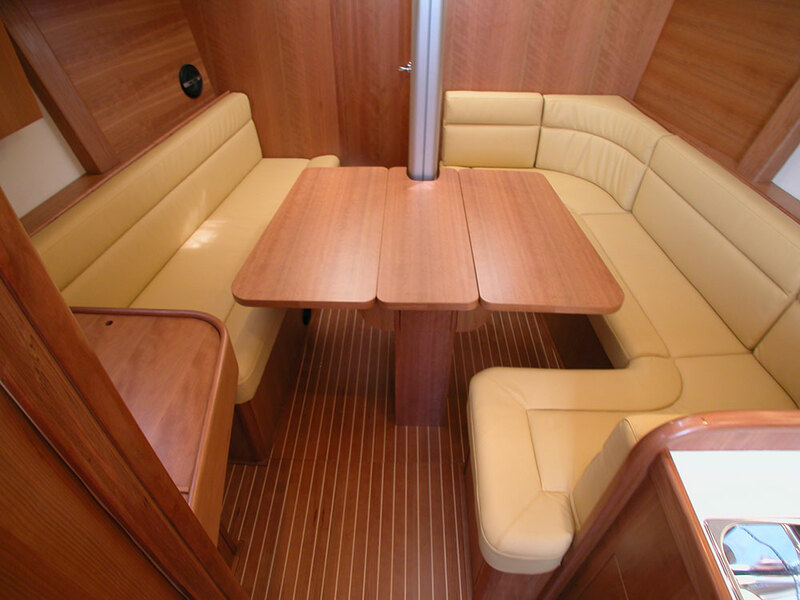 An excellent compromise offering top performance with maximum ease.